The AMDA team continues its relief activities in Chengannur City in Kerala State. On 31 August, the team was joined by a coordinator dispatched from AMDA Nepal. Then, the team conducted a field survey in Piralassery in Mulakuzha Village, Chengannur City, in cooperation with Chengannur Rotary Club. Right alongside Piralassery runs a river and, as a main road that is at a higher level than the houses there runs through the area, the majority of houses were completely flooded. The local residents are currently living in tents pitched along both sides of the main road. The field survey revealed that, like before, the families there too were in need of kitchen utensils. So, on the following day (1 September), the team distributed kitchen utensils to the 28 families living in the area. 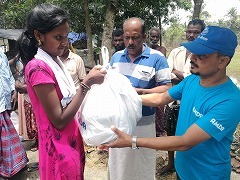 On 2 September, the team distributed kitchen utensils to an additional 80 families in Kadakkapallam and Kodamthururhu, both also in Mulakuzha Village. Kodamthururhu, which is connected to the nearest main road by an unpaved 1km-long path, became surrounded by water with land-access becoming impossible until the water receded days later. 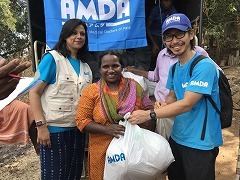 On 3 September, the AMDA team distributed relief supplies and provided medical relief in two areas. 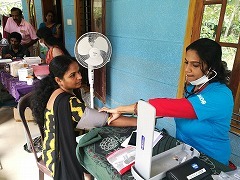 For the medical relief, the AMDA team cooperated with a different group called Sewa Bharati in Kallissery in Mazhukeer Village. The majority of patients suffered from coughs, fever, itchy skin and body pain. 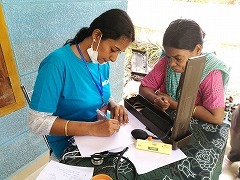 As the Kerala State government issued an alert for communicable diseases such as leptospirosis, the joint team took action to prescribe preventative medications when treating patients. The joint team saw a total of 137 patients that day. The distribution of relief supplies took place at a school (Government Higher Secondary School) in Angadikkal Village, again in cooperation with Chengannur Rotary Club. 50 of the 250 students in this school were affected by the flooding. 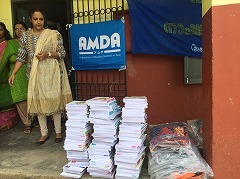 The AMDA team distributed one school bag and five notebooks to each of the 50 affected students. 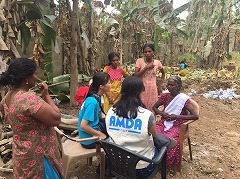 Further, on 3 September, the AMDA team began conducting medical relief in Karnataka State, which was also affected by the latest flooding. One more coordinator arrived in the area on the day before (2 September).